Serve this BBQ Pork Chops Recipe at your next party to impress the crowd. 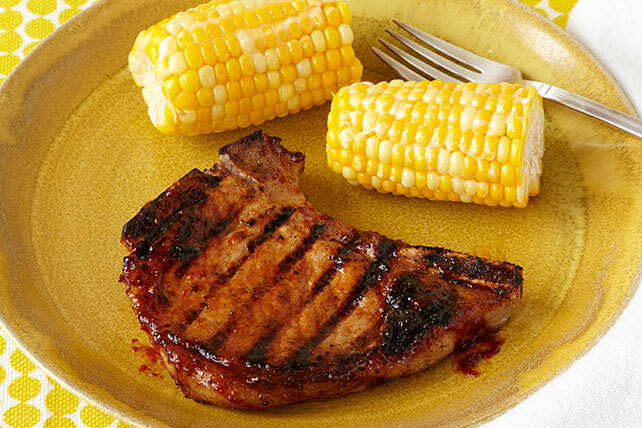 This BBQ Pork Chops Recipe is marinated in a brine & brushed with BBQ sauce. Mix water, 2 Tbsp. sugar and salt until sugar and salt are dissolved. Pour over chops in resealable plastic bag. Seal bag; turn to evenly coat chops with brine. Refrigerate 1 hour. Meanwhile, mix remaining sugar and seasonings. Heat grill to medium-high heat. Remove chops from brine; discard bag and brine. Coat chops evenly with seasoning mixture. Grill 5 to 6 min. on each side or until done (145ºF), brushing with barbecue sauce for the last few minutes. Remove from grill. Let stand 3 min.